... 1940 (70 years ago today), 4 French teenagers followed their dog into a narrow cave at Montignac, a town near the city of Bordeaux. 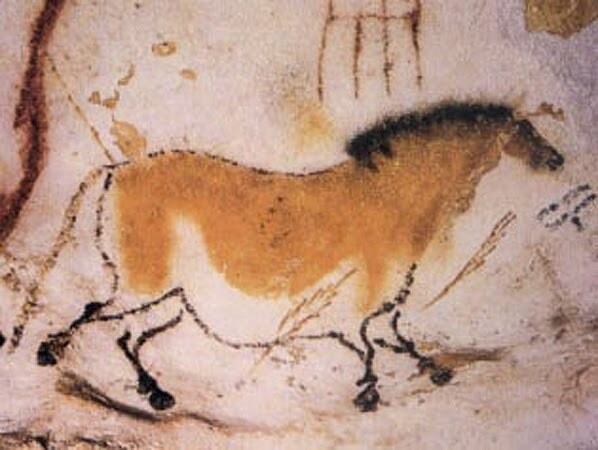 They found a trove of illustrations in the Lascaux grotto -- "15,000- to 17,000-year-old paintings, consisting mostly of animal representations," like the one at left, that "are among the finest examples of art from the Upper Paleolithic period." Closed to the public in the 1960s because lighting was causing harm, the paintings may be seen today solely in replica, at a site "opened nearby in 1983," which "receives tens of thousands of visitors annually."